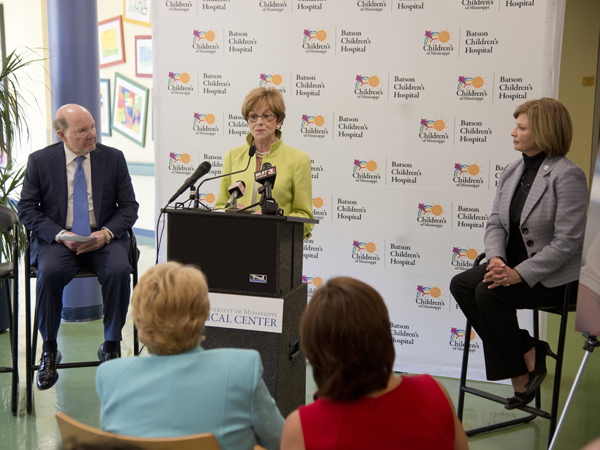 Joe and Kathy Sanderson are chairing a $100 million fundraising campaign for Children's of Mississippi, the umbrella organization that includes all pediatric care at UMMC and Batson Children's Hospital. Leading by doing, the CEO and chairman of the board of Sanderson Farms and his wife are not only heading up the drive, the largest in the history of Children's of Mississippi, but they are also making the campaign's first large gift: $10 million over the next five years. “This is a wonderful day for the medical center,” said Dr. LouAnn Woodward, UMMC vice chancellor for health affairs and dean of the School of Medicine. 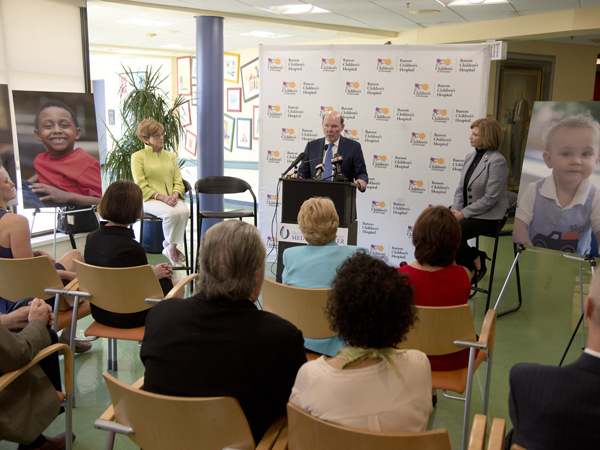 Woodward cheers at the announcement of a $10 million gift to Children's of Mississippi by Joe and Kathy Sanderson, looking on. The funds will help the Medical Center expand and update its space dedicated for pediatric care including an expanded and renovated neonatal intensive care unit, more rooms for the pediatric intensive care unit, more operating rooms and the creation of an imaging clinic especially for pediatric patients. 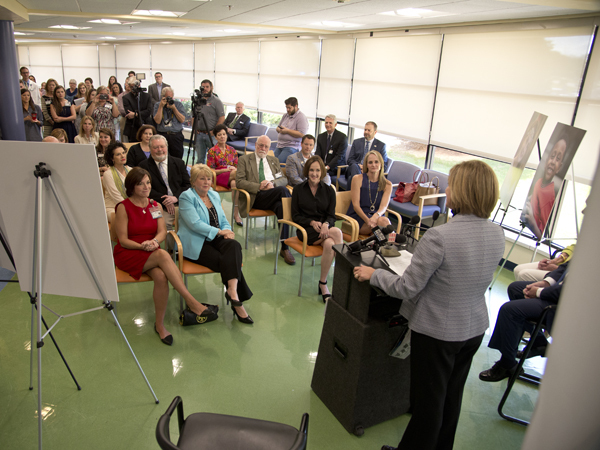 A new pediatric clinic will make care for outpatients more convenient and comfortable for families. Expansion of the Children's Heart Center is also on the drawing board. Batson Children's Hospital is the only hospital dedicated exclusively to the needs of children in Mississippi. “Children's of Mississippi must grow so Mississippi's children can keep growing,” said Joe Sanderson. 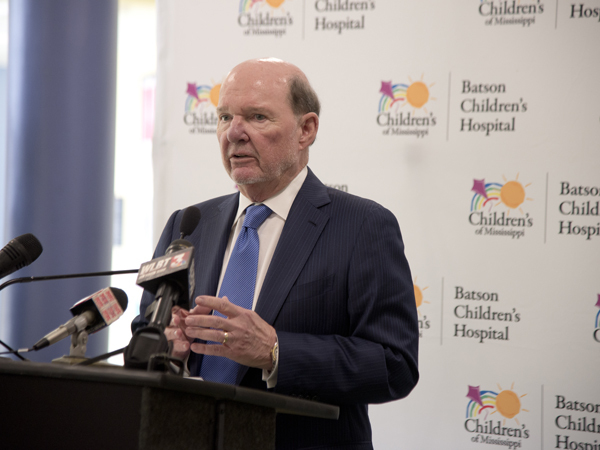 Members of the media, supporters of Children's of Mississippi and UMMC physicians, faculty and staff gathered at the lobby of Batson Children's Hospital for the announcement of the Children's of Mississippi capital campaign. Knowing the demands of serving a growing population and of raising funds to meet those needs, Woodward said the question was who had the vision as well as the concern for Mississippi's children to bring these goals to fruition. The Sandersons know Batson Children's Hospital well, not only through their philanthropy but because their granddaughter, Sophie Creath, was a patient at the hospital as a young child, suffering from pancreatitis. “After witnessing the competent, loving care of (pediatric gastroenterologist) Dr. Paul Parker and the team at Batson, we realized the importance of this wonderful hospital,” said Kathy Sanderson. Kathy Sanderson tells of the excellent care her granddaughter received at Batson Children's Hospital as a young child. She and her husband Joe Sanderson have been active supporters of Children's of Mississippi since. Though they received the best of care for their granddaughter, the Sandersons realize that growth and expansion are needed. “We believe that the hospital is at maximum capacity and is lacking in several vital areas,” Joe Sanderson said. “The hospital is beyond capacity in the neonatal intensive care unit and is badly in need of additional space. Children have to be transported to the main facility at UMMC because of a lack of equipment at Batson. Children sometimes need sedation when being transported. And further, there needs to be additional facilities for pediatric surgeries, particularly cardiac surgery. Joe Sanderson tells more about what a Children's of Mississippi expansion would mean to the state's economic development as well as for future generations of Mississippians. Having the best of care for our children is a cause the people of Mississippi can embrace, Joe Sanderson said. “I think people across the state have a great deal of respect and admiration for what is being done at the state's only children's hospital. I think that when the story is told about the need of today and for the future, I think people will be willing to help make the project become a reality. Of all the things to which they could give, this project will be one of the most important and last longer and impact our state and the children of our state more than anything else they could do."